Every student can benefit from extra help with matters of organization and style in the writing of term papers, theses, and dissertations - as a precursor to better grades and greater respect. This handy guide from the best-selling author team of "The Art of Scientific Writing" shows how to achieve maximum benefit with relatively little effort. Based on a proven concept that assumes no special talent for writing, the book will be of great value to both native and non-native speakers of English. The treatment is rich in examples and challenging problems (with solutions provided in an appendix), applicable either in conjunction with a course or for self-study. William E. Russey earned his Ph.D. in chemistry at Harvard in 1967, where he was in the research group of E. J. Corey. His professional life was spent on the faculty of Juniata College, Huntingdon (Pennsylvania), from which he retired as Dana-Supported Professor of Chemistry in 2002. Translator of several books, primarily for VCH, and numerous articles for Angewandte Chemie, he has also co-authored the books 'The Art of Scientific Writing' and 'Text and Graphics in the Electronic Age'. Hans F. Ebel received his Ph.D. in chemistry in 1960 with Georg Wittig at the University of Heidelberg (Germany). He was for many years Senior Editor and later a member of the board of directors of the publishing house Verlag Chemie/VCH (now Wiley-VCH). Author and co-author of numerous original publications including books, he has been active since 1982 in the field of scientific publication. Claus Bliefert has since 1973 been a Professor of Chemistry at the University of Applied Sciences Münster (Germany) where he is heading the school's Laboratory for Environmental Chemistry. Author and co-author of numerous books, including several in the field of scientific communication, he regularly presents lectures and seminars on topics like "Scientific Writing" and "Technical Presentation". "This book can be recommended for science students of every level who have to prepare a thesis." "... this is an excellent book which all students should read ..."
Written reports accompany college and graduate students throughout their course of study. The most challenging ones are term papers, master's theses and - as is often the case with a science degree - a doctoral dissertation. With the right preparation and a little knowledge of rules and conventions, everyone can improve their grading by preparing reports that are flawless in terms of format and style. 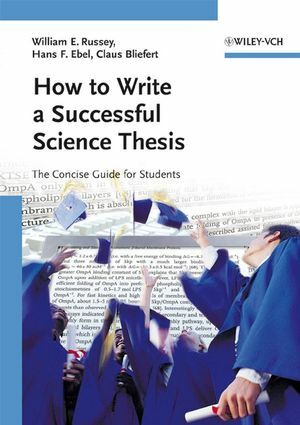 This is an easy to read guide to scientific thesis writing that explains rules and conventions, and helps to avoid common pitfalls and abounds with practical advice for a better and more efficient composition of term papers, theses and reports. It appeals to a broad target group. Didactic Approach: Examples and study questions (with solutions in the appendix) make it easy to develop one's writing skills. This guide can be used as a course book but can equally well be used for studying on one's own.